The first Aalto DBA is fresh from the oven! Elina Kukkonen defended her dissertation. The first Aalto DBA is fresh from the oven! Elina Kukkonen defended her dissertation ”Gaining more value from Customer Relationships in the Digital Business Environment” on April fools’ day. But our stellar candidate was nobody’s fool; an excellent work! Elina certainly fulfilled all the requirements, both academic and managerial. Aalto EE congratulates its first DBA! A DBA dissertation has to have a fair share of managerial implications and genuinely benefit the business area or organization it pertains to. But this does not mean it could ignore academic rigor, theoretical frameworks and even developing new theory. The conclusions and further discussions need to be well-structured and warranted. The methods need to be consistently used and the data collection needs to be clarified and the data carefully analyzed. The above is basic knowledge to anyone living the dissertation life or being a member in the academic community… And the description of the path I am following currently. This is why I am personally so proud of Elina and stunned by the high academic quality of her dissertation. When congratulating her, I had to confess that I look up to her with some envy. And I also promised to follow suit within one year. So what is the status of my current work? My qualitative research using the case study method is advancing at a pace that is far too slow for my temper. But the skeleton is there – this is actually the title of my master file on my Mac – and little by little things are getting structured in my head and in all the sub-files of mine. The empirical data is almost there for me to analyze. The collection of data has been done through interviews, observation, going through documents and a myriad of academic and practitioner articles. The literature review is almost done and the theoretical framework is taking form. The list of contents is basically in its draft form; my supervisor said that now it is just about filling in the blanks! How much is still to be done makes me very humble and forces me to schedule my days, evenings and weekends meticulously. Luckily I have been writing some conference papers and received reviewer comments that are now invaluable as is the support from my academic supervisors, professors Tikkanen and Tienari. Both the topic - Talent Management and the context - a non-profit or more precisely an INGO (International non-governmental organization) - still fascinate me as the research area. “My” INGO is the International Federation of Red Cross and Red Crescent Societies (IFRC). The case; a carefully selected pool of very experienced individuals having many “field missions” under their belt. The pool is called the Heads of Emergency Operations and consists of leaders who are deployed to large-scale disasters around the world in case the local staff is not able to handle the situation without extra help; normally these situations, e.g the floods in the Philippines or the earthquake in Haiti, involve numerous stakeholders, aid workers, and in the center of it all, the victims and beneficiaries. Handling and coordinating all that is a very demanding task, so identifying the right talent to do the job is of essence. Working under in emergencies puts the whole concept of leadership in a totally new perspective." Working under in emergencies puts the whole concept of leadership in a totally new perspective. Humanitarian aid workers and leading in emergencies have been a topic for many studies and white papers, but academic research is lacking. This, I hope, makes my research interesting to the academic community and the non-profit sector alike. I am also intrigued to find implications to corporations. The questions that are in the core of my study are e.g. as follows. What are the particular competences and skills that are required from the HEOPs pool? How does IFRC define the talent they want to recruit to this top pool of humanitarian aid workers? How is Talent Management (TM) handled at the IFRC and do the TM processes used in the corporate world benefit this sector? What can corporations learn from the processes used in the field of humanitarian aid? An example of a learning point for the corporate world could be people development: how to enhance leadership competences in emergencies, which are not a metaphor like the “burning platform” that was used frequently some years back in the business lingo, but real disasters costing human lives. These are only some examples of questions I am working on. My own 14-year experience in the research organization is naturally a very rich source of data. It also obliges me to come up with recommendations to possibly improve or streamline processes in order to achieve even better leadership and identify talent. I owe that to the organization that has given me a lot and is constantly working towards a better world. 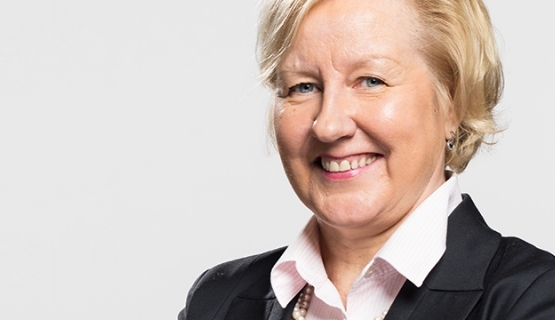 Riitta Lumme-Tuomala is Director, Russia and Talent Management, Head of Growth at Aalto EE. She is also an Aalto Executive DBA candidate. Currently reading: Aalto Leaders' Insight: My DBA Journey: The first Aalto DBA is fresh from the oven!